The FastPipsBounce indicator is a ready trading solution based on scalping on the smaller timeframes with small values of Stop Loss and Take Profit. The indicator preliminarily marks the beginning of the possible trading area on the chart using a monochrome rectangle - green for buys and red for sells. This event is also confirmed with audible and visual alerts. When a new bar appears, several auxiliary arrows in a row will appear arrow or below them, indicating the preferable trading directions calculated by the indicator. It is important to understand that the rectangle and arrows are not trade signals, but merely warnings that a trade should take place in near future. The trade signal is generated when at the opening of the current bar a large red arrow (for sells) or green arrow (for buys) appears. Also, at this moment the rectangle will change its color to double, and will show the Stop Loss and Take Profit levels for the current trade using its High and Low levels. These levels are specified by the user in the indicator settings. 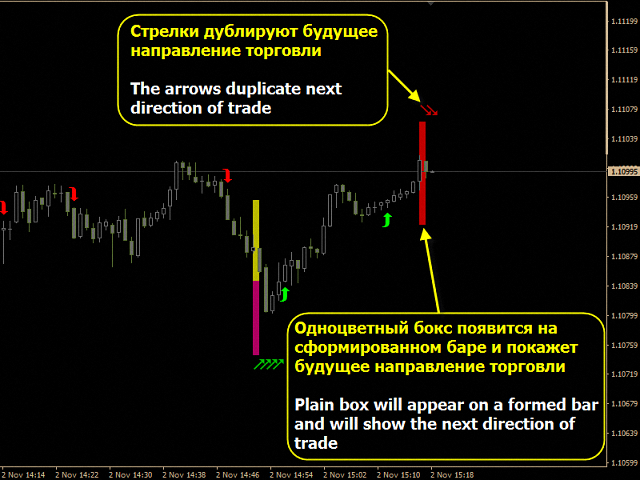 When a trade signal appears, it is confirmed with audible and visual notification. After the signal is processed, additional arrows may appear in the same direction. They can also be considered valid trade signals, but the Stop Loss and Take Profit will need to be calculated separately. As a rule, they should be less than in the trade at the first signal. The FastPipsBounce indicator has a complex structure, but it is incredibly easy to use. All its signals are clear and unambiguous. The arrows appear at the opening of a new bar. They never repaint, do not change their location and do not disappear. By default, all parameters are configured for the M5 timeframe. But every trader should customize them according to the trading plan and preferences. Setup TakeProfit - take profit in pips. QuarterBack - sensitivity of the indicator (rough). Optimal values: 13 to 29. Range - sensitivity of the indicator (fine). Optimal values: 0.2 to 1.6. Scope - extremums search range. Optimal values: 55 to 90. Bars to calculate - number of bars for calculation. Optimal value - 1000 or more. AlertsMessage - message about the indicator signals (True - enabled \ False - disabled). AlertsSound - sound for the indicator signals (True - enabled \ False - disabled). AlertsEmail - send email messages about the indicator signals (True - enabled \ False - disabled). AlertsMobile - Push-notifications (True - enabled \ False - disabled). SignalArrow gap - distance from the arrow to the High-Low of the current bar (in pips). Arrow size - arrow size. SideArrow color UP and DN - colors of the duplicate arrows. 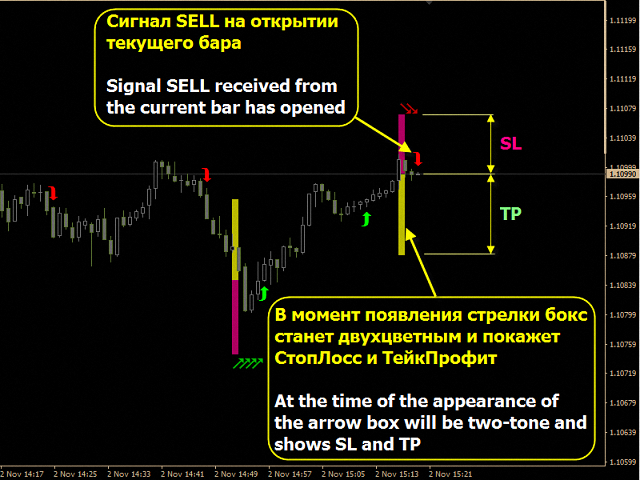 SignalArrow color BUY and SELL - colors of the signal arrows. Prep Box color UP and DN - colors of the monochrome boxes for preliminary signals. 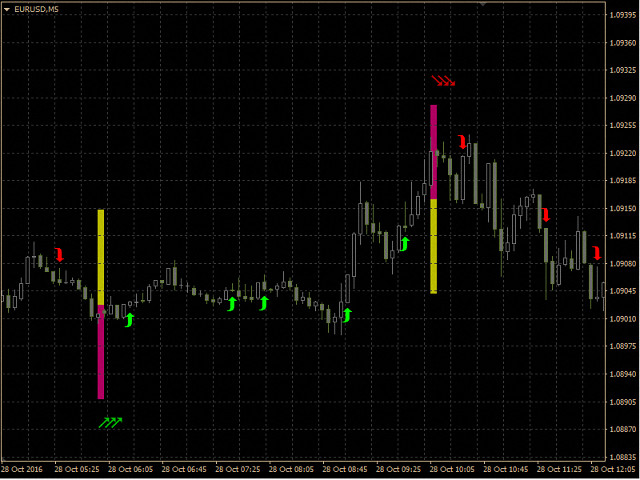 Signal Box color TP and SL - colors of the two-colored boxes for the Stop loss and Take Profit. Use the indicator with caution during the significant news release and continuous movements. It is based on searching for the possible short-term market reversals and is best used on pairs with low volatility, when there are no news releases and pronounced protracted trend.